For once in my life, I was RIGHT! I was right BIG time! Now, my husband will back me up here. This process literally wore me out. It took me two full weeks to the day to process all of the food. My dishwasher ran at LEAST 3 times a day during that time and I fell into bed beyond exhausted every single night from being on my feet in the kitchen almost non-stop for 14 days. It was so worth it though. 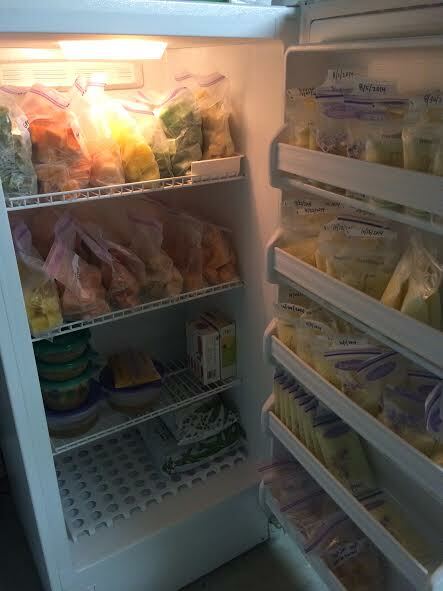 My deep freeze is STOCKED for the next 3+ months of healthy, organic, homemade food for my baby girl. I know exactly where it came from (Costco gives a lot of detail on where the produce originates), what went into it (because I did it! ), and when it was frozen. At the end of it all, I froze almost 750 ounces of food for Polly (which would be just shy of 200 4oz jars if I were to have bought them at the store). For comparison’s sake, I looked at the store the other day at the Earth’s Best (organic) 4oz jar of Stage 1 carrots so that I could have a frame of reference to do my calculations. It was $1.19 per jar. I’ll spare you the math, but for all of that food, I spent $85.79 at Costco. Here’s the kicker. I SAVED $123.41 on what I would have spent on the SAME amount of jarred baby food. Please keep in mind, this is my personal blog. My opinions may differ from yours, but it these are my personal beliefs. I don’t write to start an internet word battle–please keep that in mind. We live in a scary world, in case you hadn’t realized. I knew we did, but my eyes were opened to a whole different look on things after Polly was born. Evil rages against us daily. It shows itself in jealousy in the faces of other parents, judgement all OVER social media, feeling discontentment while we scour Pinterest, defending our parenting choices to our own families or your parenting partner, habits/knowledge/actions our children pick up at playdates…it’s everywhere. Still, I am more terrified of a more silent predator. Parents, in case you didn’t know, our kid’s childhood is being stolen and it terrifies me to my very core. We live in a world where technology is EVERYWHERE. Before I became a Momma, I spent 5.5 years working for one of the largest, privately owned technology resellers in the country, so please know, I am surprisingly aware of the tech industry. I have seen the millions of dollars and countless hours of time saved by small and large companies through the implementation of technology. Still, I am terrified of it. Like so much so I want to raise my daughter underground, in a hole where WiFi can’t reach. Hear this parents: Technology is stealing our kid’s childhood. Mark my words. When we were bored when we were kids, what did we do? We played outside, colored, built forts, rode our bikes, practiced a sport, read a book, hell, we threw a ball against a garage door for hours on end…it didn’t matter! The point is, we entertained ourselves. We used our imaginations. If you were like me, an only child living in the boonies, you had a whole world of imaginary friends! I know there are children these days that are exceptions to this rule, however, I think most would agree that now, a large part of “active and imaginary creation” has been replaced with apps on an iPad or Surface. When Mom needs a break, she can sit her kid down with an “educational app” and have a moment of silence. I have a 7 month old, so I have not faced the challenge of 8 uninterrupted hours with a toddler who is on strike from taking naps and all I want to do is resort to the iPad occupying the kiddo for a bit, but I have read a LOT of documentation written by the American Academy of Pediatricians, retired teachers, and leaders/CEOs/etc. of the technology industry who echo my fears. While it’s intentions are good, the fact that books like Goodnight iPad (a parody adapted from the classic, Goodnight Moon) even exist should tell you something. This whole debate has spurred many a conversation in the Bryant household. What will the use of technology look like in our home as Polly grows? Will we throw it out all together? Will we try some “limited use” scenario and hope it works? It’s easy to say now, “Oh we just won’t have iPads/laptops at her disposal. If that makes her the “weird kid”, so be it”. But we all know it’s not that easy. Throwing another kink into the chain, our public school system is throwing SO much curriculum on teachers, they HAVE to use technology to try and cover it all. So even if we try to shelter our daughter from technology, she NEEDS to learn to to learn from it because she’ll be expected to do so when she gets to school. I’m lucky. I married a man who is paid to be creative. I kid you not, I stand over my daughter’s crib at night and beg God for clarity on how our family will face this challenge. I want Polly to grow up wanting to color a refrigerator box with Dad rather than playing a Hello Kitty app on a tablet. I want her to run around outside and chase a dog rather than sitting in front of a TV. I want her to create magical forts out of ratty old sheets with me and BEG me for days not to take them down even though I almost broke my leg trying to go to the bathroom in the middle of the night. I fear for my child’s childhood. I fear, if I’m not careful, it will be stolen. They are only children for a short time. I by NO means have answers and I by NO means judge any other parent who has a different opinion on this subject than I. But know, if you’re ever around my kiddo and I ask you to turn the TV off, or to put your phone/iPad away, please know it is out of love. Before you get upset with me, take a minute to watch her straining to see your screen, because she is. Already. It’s too early for that, and she already is. Will and I don’t like thieves and from where we sit, technology is out to get something I can never give back to our baby girl. I know this subject isn’t black or white. I know there are families everywhere who tackle this daily and somehow raise children perfectly (my sis-in-law with the most perfect, respectful, creative, sweet, GRACEFUL little girl you’ve ever met). But, keep in mind, the first iPhone was released in June of 2007. Think about how far our culture has come less than 7 years with smart phones, tablets, etc. Now put yourself in my shoes. Where will we be in ANOTHER 7 years. Your child may be in high school or getting ready for college and it will be completely appropriate for them to have their own phone, iPad, or whatever. But mine will be 7 years old…just starting kindergarten. Now do you understand my fears? All that to say, sometimes I wish I didn’t have access to so much information opinions via this handy dandy phone of mine. Polly has been an easy baby. We’ve been very lucky. However, after traveling home to Texas for extended periods of time for Thanksgiving and Christmas, her beautiful little routine has been thrown to hell in a hand basket. The days since we returned home to Portland have been really, really hard on all of us and I feel myself getting more and more frustrated and losing patience with her at a much quicker rate than I’d ever like to admit. After a small breakdown last night, I got so angry with myself. “Sally, you prayed for a baby for years. You were told you may never have one. How dare you get frustrated/upset with her. You don’t get ‘bad’ days.” These were all things streaming through my head last night. This is where I’m thankful for a husband who really enjoys playing “devil’s advocate”. (The rest of the time it frustrates the mess out of me because I just want him to take MY side! HA!) William gently reminded me this morning of two very, very important things. She’s only a baby for a very short time. Savor it. The good days AND the bad. Tonight, this is coming in the form of a little “Mommy’s Night Out” sponsored lovingly by my amazing in-laws, but I do think that sometimes, taking a step back provides a little perspective. No matter your situation on how you became a parent, you’re going to have bad days. The internet is a black hole. God gave us “Momma instincts” for a reason. Listen to them. When all else fails, don’t retreat to the internet for answers. Retreat to your instincts and to the wise women in your life who have successfully reared semi-normal adults (that’s YOU Mom)! And most importantly, give yourself a little grace. This afternoon, before Polly’s nap, I apologized to her for getting frustrated (though she had no idea what I was saying) and smiled and hugged her something’ fierce. That she understood. If you see me, remind me to savor every day. The good days AND the bad. Every Momma needs reminding. They’re only babies for a very short time. The last time I blogged, we were fighting an infertility battle I never dreamed we’d have to fight. Isn’t it crazy how we dream up these “plans” for our lives years in advance? Or maybe that’s just me–I’ve always been a “planner”. One way or the other, my “plan” never included doctors, drugs, tears, tests, and months and months and months of waiting. We began to remind ourselves to ‘Count Our Blessings’, because boy did we have them–we just didn’t have the one we were hoping for. Fast forward three years. It’s New Years Eve. I’m sitting on my couch in my robe while my baby girl sleeps 30 yards away from me. (In all honesty, I’ve never been a big NYE person, so I may have been sitting here in my robe with or without a 6 month old, but that’s neither here nor there) Never in my life did I dream I’d be infertile. Never did I dream we’d be told on a Tuesday we may never have our own child and find out 48 hours later one was already on the way. Never in my life did I ever think I could love someone as much as I love that little girl. How I have counted my blessings, and they are many. 2015 is almost here on the West Coast. In 65 minutes to be exact. I will start the year unemployed for the first time since I graduated from college. 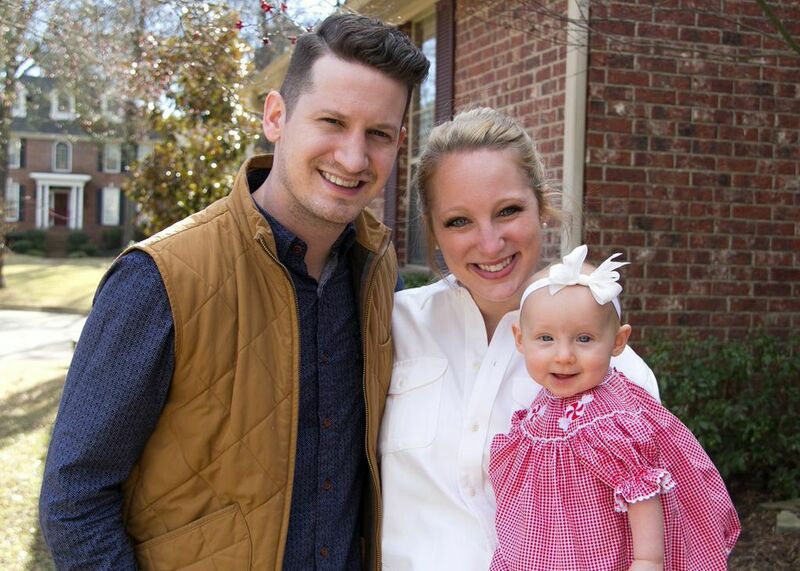 My husband will continue to carry our financial burden so that I can live my dream of raising our daughter–something that I will never fully be able to repay him for. This “plan” for my life always included lots of kids and a beautiful home and was free of worry and want. But it is just that–a “plan”. A flawed plan. A plan that, if I’m not careful, can rid my heart of joy and replace it with want, doubt and discontent. Count Our Blessings. For there are many. This year, our family has big decisions to make. We never dreamed we’d still be in Portland after 3.5 years–I don’t think we ever thought we’d love it as much as we do. It wasn’t in our “plan”. I can honestly say, I no longer have a “plan”. Wouldn’t know what to do with it even if I had one! We’re traveling to Nashville, TN in February on a recon mission and are considering moving our family there in the fall. It’s one option of a few we’re considering, but all for different reasons. How do you know what the right decision is? How do you leave behind the house you brought your daughter home to? How do you choose to live 2,200 miles away from family? The answers, I’ve decided are: You pray, You just do, and I don’t know. All solid answers I guess, though not definitive ones. I don’t set New Years Resolutions. Quite frankly because I can’t keep them. Hell, I can’t get myself showered and dressed on a consistent basis. My only desires for this year are to become a more selfless mother, a more devoted wife, a more sensitive daughter, and a more attentive friend. Everything else will fall into place. Or it won’t. But, count your blessings. For they are many.